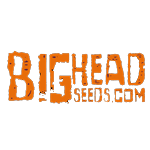 Big Head Seeds - Dogstar Dawg. Free US delivery. Her smell hits you straight away, pungent diesel tones with some pine and citrus in the background, and then her thick smoke just ramps these diesel flavours up even further for some of the dankest smoke around - sure to be a hit with cannabis connoisseurs. Her effects hit fast and hard and last a long time, with a big rush of sativa energy and euphoria, making it ideal for social occasions and outdoor activities. She often brings the munchies and the giggles making it a great party smoke.